Before I describe the new Cadillac CTS, may I ask you a question? 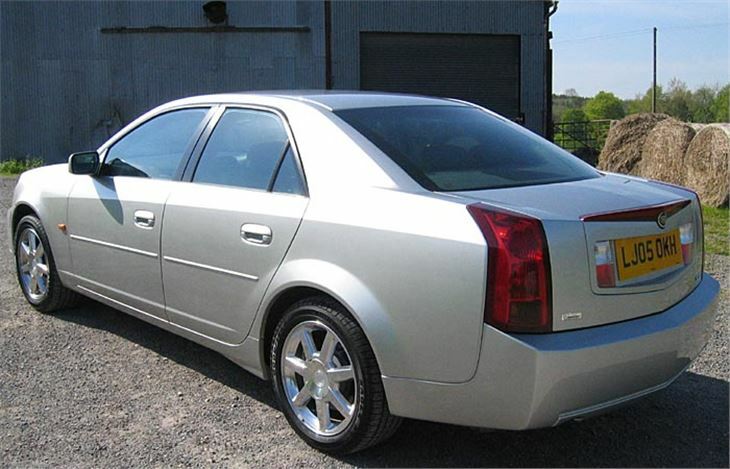 What does ‘Cadillac’ mean to you? A vast V8, V12 or V16 from the 1930’s? A befinned behemoth from the 1950s? A Ghostbusters ambulance? An Eldorado pimpmobile? A long, black hearse? A Seville, unsuccessfully imported from the mid 1970s to mid 80s, then again in the 1990s? 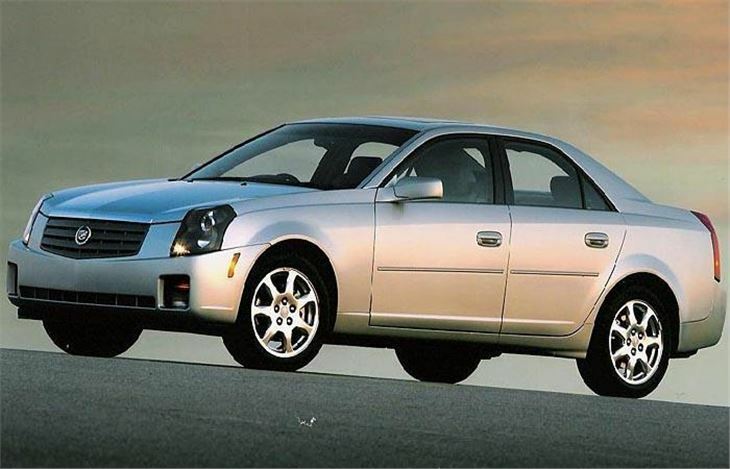 Unfortunately, Cadillac’s brand values as one of America’s finest cars have been diluted by some terrible dross, but you can’t blame General Motors for wanting to re-establish its best name as its best car. That wasn’t going to happen if they continued to build them the same old American way. So Cadillac’s fresh new cars are built in a fresh new factory at Lancing, Michigan, to quality standards that, in the latest JD Power surveys, even beat Lexus. The CTS now being imported to the UK with right-hand-drive has been on the market in the USA since 2003. It was already a good car, but GM wanted to refine it and be absolutely sure of getting all the bugs out before introducing it to more critical Europeans. 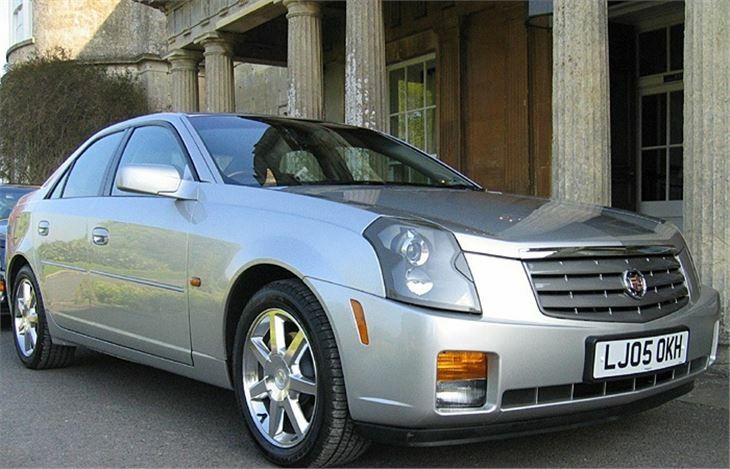 The CTS we are getting now has new chain-cam 3.6 and 2.8 litre V6 engines, a slick 5-speed autobox, rear wheel drive, and the sort of road-handling no one believes possible of any American car until they drive it. They’re good value, too. Starting at £25k for the 215bhp 2.8 and rising to just £30k for comprehensively equipped 257bhp 3.6 which is bound to be the best seller and is the subject of this test. Its looks are a bit of an acquired taste, especially that chunky front which also adorns the latest US presidential limousine, and the rather brash boot. 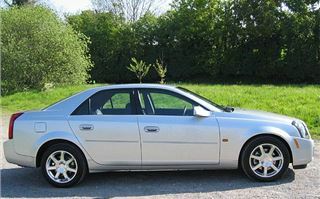 But the side view is fine and at least the car is distinctive and carries a certain amount of prestige. Nothing else looks anything like it. 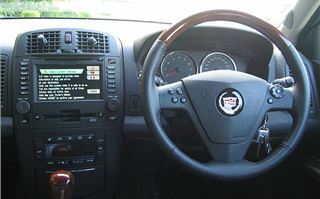 Inside you get lots of kit, including colour-screen satnav, leather, a Bose sound system, electric everything and a steering wheel that tilts though such a huge arc it is capable of accommodating even the most supersize Americans. Start up, drive and it’s fine. No slop or wallow at all. It feels fairly similar to a big Mercedes. There’s no tipfunction to the transmission, however. Just 1-2-3-4 if you want so self-select lower gears, but that’s no problem. There are three transmission modes to choose from: Winter, when it starts off in second, Normal when it changes up early and acts like any standard autobox, and ‘Sport’, which transforms its character completely. If you are a left-foot braker you will love this car in ‘Sport’ because it allows you to control the changes with your feet. 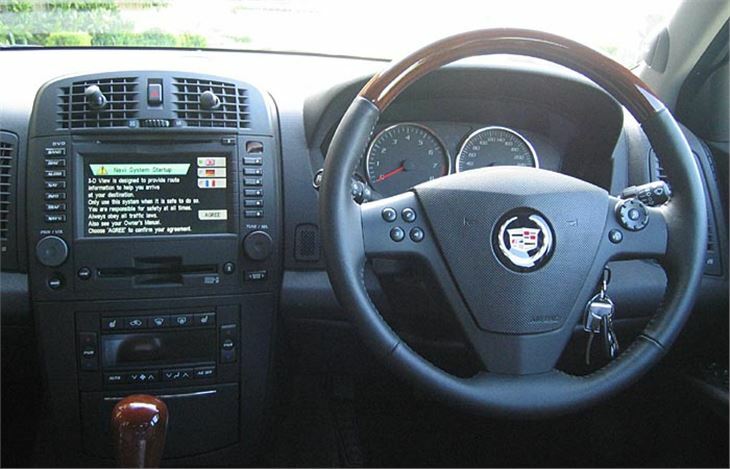 No need for a ‘tip’ lever or buttons or paddles on the steering wheel, you get the gear you want with your feet and it stays in the right gear all the way through the corner. In kickdown in Sport you’ll see the needle push close to 7,000rpm, if you want it to, accompanied by a glorious banshee V6 howl reminiscent of a Honda NSX at full chat. 0-60 takes just 6.7 seconds. Excuse me? I hear you say. Aren’t you talking about a Cadillac here, not a supercharged Mercedes or a hot BMW? As I wrote before, this is a Cadillac unlike any Cadillac that has gone before. Whack it into a bend (the first bend on our route, actually, since it inspired so much confidence) and you get proper, adjustable rear-drive grip with steering feel so far unfelt in an American car. No air suspension or anything like that. Instead, a Sigma floorpan incorporating Nivomat self-levelling suspension and StabiliTrak stability control system developed on the Nürburgring. So good, you don’t even notice the electronic angels keeping you on the road. Tyres are a sensible 225/50 R17. I don’t like cars with hard, uncompromising suspension more suited to the racetrack than the road. To my mind this Cadillac gets it almost as right as a standard BMW 5-Series without quite the same oily precision as the BMW’s steering. Sometimes there’s a trace of float over crests, but you’ve got to be driving ridiculously quickly to notice. 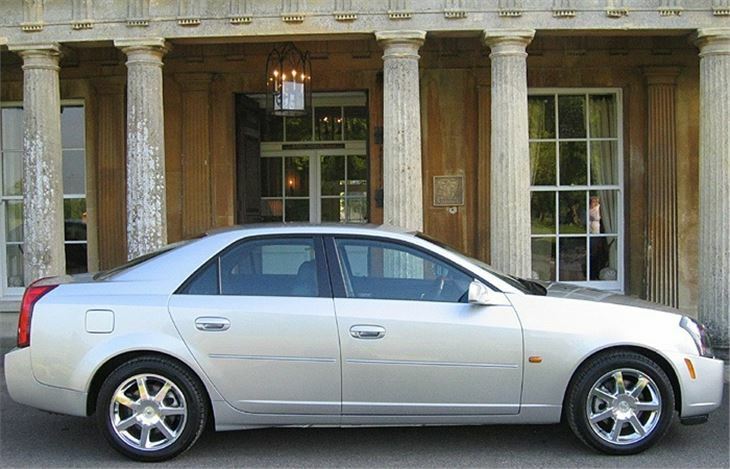 For day-to-day luxury with the extra capability of quick A to B times, this is a fine car. It’s not completely fault-free, of course. The parking brake release is a pull handle directly above the almost identical bonnet release handle. So for drivers unfamiliar with the car it’s a bit too easy to pop the bonnet instead of release the parking brake. And while the electronic systems are great at the sort of cornering speeds you’d normally reach on public roads, if you push it really hard on a track you don’t get the same reactions as you’d get from a BMW. There’s also a hot version: the 400bhp 6.0 litre V8 6-speed CTS-V, that looks really mean in black with its mesh front grilles. Sounds good too. Turning into a quick corner and letting it rip you can pretend you’re a NASCAR driver. But it’s not quite as integrated, nor as well sorted at the Holden/Vauxhall/Opel Monaro with the same engine and box. Looks better, but just doesn’t give quite the same satisfaction, and costs all of £13,000 more than the Monaro. A lot of people will buy a Cadillac CTS simply to get out of the flock to whom the only choices are an Audi, a BMW or a Mercedes. 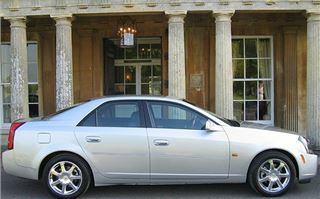 And if they drive their CTS in ‘Sport’ mode they’ll have a car that’s well up there with the big three status brands for a lot less money. The other market out there is those who sorely miss the Scorpio, the Senator and the Omega. At last, another big rear drive saloon that isn’t an Audi, a BMW or a Merc, and in this case isn’t even German as of course the Scorpio, Senator and Omega all were. 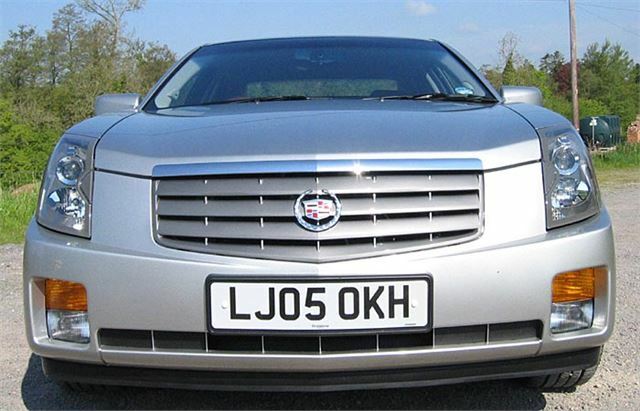 Cadillac is only looking at limited numbers for the UK market, so buy one and, until the end of the year at least, you’ll have a car that looks very special but very few people know what it is. The ideal getaway car, then.